Foreign workers, primarily from Southeast Asian countries, have for years comprised an indispensable sector of the blue-collar workforce in Taiwan. They work mostly as domestic caretakers and industrial laborers. They suffer loneliness from being separated from their families, and pressure from work and life on their own. It is the ability to send money home to support their families that keeps them going when times get hard. Tzu Chi does what it can for these people, providing free clinics to help them live healthier and happier lives in a foreign land. 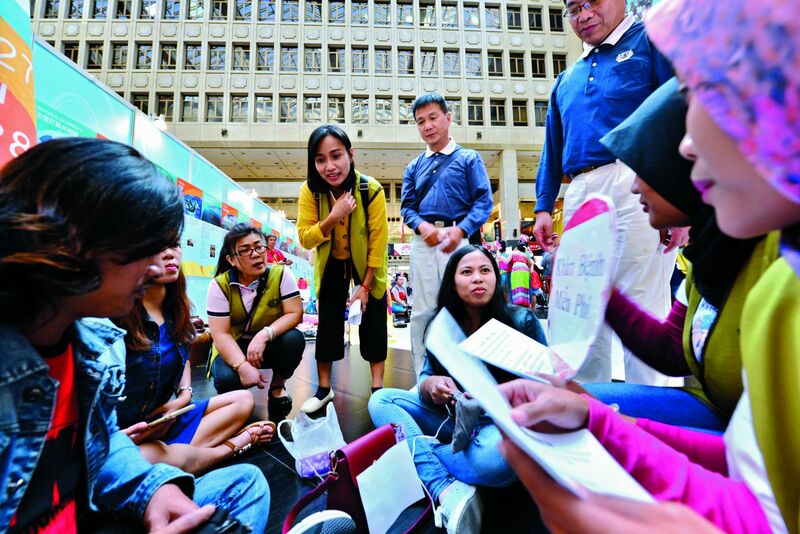 Groups of young people, some of them clad in clothing representative of their culture or religion, sat on the checkered floor one Sunday in the lobby of Taipei Main Station. Some were talking and gesticulating cheerfully; some were playing the guitar and singing popular tunes from their homelands; others, gathered around a birthday cake, were celebrating a birthday among friends. The train station is a popular gathering place for foreign migrant workers in Taipei, most of them from Southeast Asian countries such as Indonesia, Thailand, Vietnam, and the Philippines. Passersby, catching snatches of their conversations in unfamiliar languages and seeing their special clothing, cast curious looks at them. 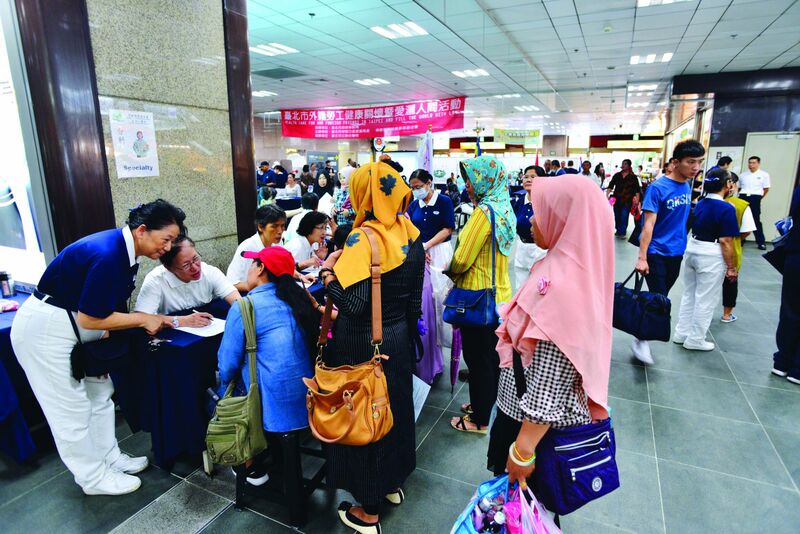 Once every two months on Sunday afternoons at Taipei Main Station, the Northern Taiwan Chapter of the Tzu Chi International Medical Association (TIMA) holds a free clinic which specifically provides services for foreign migrant workers. People start arriving after noon to take advantage of this free service. Guided by Tzu Chi volunteers, the workers are given routine checkups, and then they visit the specialty clinic for which they have come. Aside from seeing the doctor, Yuli volunteers as an interpreter at the clinic. Many patients here are also from Indonesia. Most of them, like Yuli, are live-in helpers and provide care for elderly people. When the older people they care for wake up in the middle of the night, they must get up too and attend to their needs. As a result, such live-in helpers often get tired easily because they do not have the luxury of uninterrupted sleep. When they feel unwell, they usually try to relieve their discomfort by giving themselves little massages here and there. “I feel especially homesick at times like those,” said Yuli. Falar is currently between jobs. She’s from Surabaya, Indonesia’s second largest city. She has come to Taiwan for a better-paying job so that she can give her children a better life. During previous visits to the Tzu Chi free clinic, she saw several doctors in different specialties for a variety of ailments. Her skin problem improved after she took the medicine that a doctor prescribed, and her stomach condition got better after she listened to a doctor at the clinic and stopped skipping breakfast and drinking only coffee. It has been over two decades since Taiwan opened its job market to Southeast Asian blue-collar workers. By November 2014, the number of migrant workers in Taiwan—around 545,000—had surpassed that of indigenous people. The number exceeded 700,000 by the end of 2018, meaning that one in every 34 people in Taiwan was a migrant worker. Of that foreign workforce, about 446,800 were employed in various industries and 256,400 by the social sector, including domestic and institutional care-giving. These foreign workers have become a labor force to be reckoned with in Taiwan. To help look after the health of the migrant workers so that they could have happier and healthier lives in a foreign land, TIMA started holding free clinics for them in 2004 on an irregular basis at 228 Peace Memorial Park and St. Christopher’s Catholic Church. Both venues were in Taipei and were popular gathering places for migrant workers. In 2005, these services were moved to Taipei Main Station. With help from the Taipei City Government Department of Labor and the National Health Insurance Administration, and with radio stations helping to spread the word, Tzu Chi has been offering free medical treatments once every two months at the station. This service has now entered its 15th year. In addition to the free clinics at the Taipei station, TIMA offers similar services in New Taipei City, Taoyuan City, Nantou County, Kaohsiung City, and Pingtung County. Of these places, the New Taipei City Government, working with TIMA, provides four free clinics every year at the New Taipei City Plaza. The free clinics coincide with important Indonesian, Thai, Vietnamese, and Filipino festivals. In Pingtung and Kaohsiung, TIMA holds free clinics and provides health education for migrant workers employed in the fishing industry. These healthcare events are like mobile mini-hospitals, providing treatment in specialties including dentistry, ophthalmology, orthopedics, traditional Chinese medicine, and family medicine. Checkups of blood pressure, height, and weight are also conducted at the events. 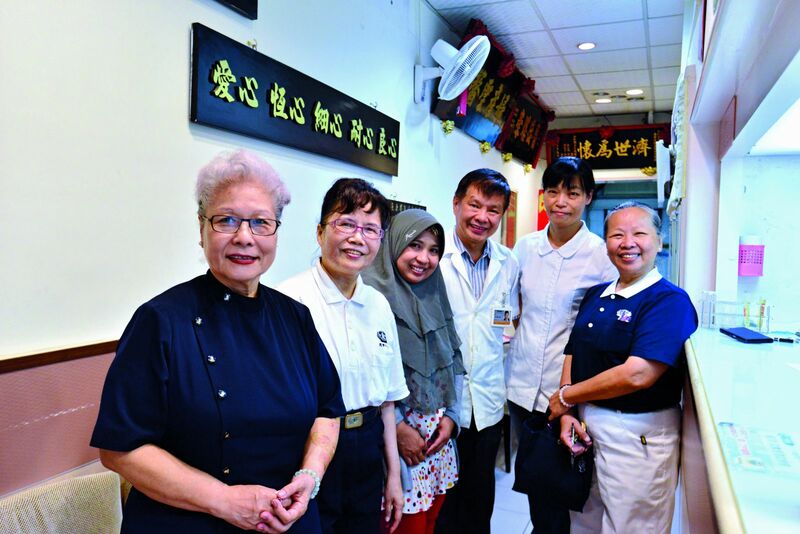 In order to care for the physical and mental health of migrant workers, Tzu Chi medical volunteers give of themselves mindfully. By looking after their health, medical volunteers hope to bring some warmth to the foreign workers who contribute so much to Taiwanese society with their labor. A mobile hospital opens once every two months at Taipei Main Station for foreign migrant workers. These free events, held on Sundays, have been going on for 15 years. Doctors in various specialties staff the hospital, and there are no limits on the number of doctors that patients can visit. Interpreters are even on hand to help patients communicate with the medical professionals. Most foreign workers who seek Lee’s help in the psychosomatic clinic at Taipei Main Station complain of work pressure. Lee listens closely as every patient explains what is troubling them, then he talks with them to help them release their pressure. He also uses simple diagnostic instruments to help them better understand their psychosomatic condition. Lee works at Taipei Tzu Chi Hospital, but he has volunteered for over a decade at Tzu Chi free clinics for foreign migrant workers. In 2001, he and his wife, Chen Jia-qi (陳嘉琦), who taught at the National Defense Medical Center in Taipei, went to the United States to pursue further studies. The experience helped him realize how challenging it is to live in a foreign, unfamiliar place. When he returned to Taiwan and learned about the free clinics Tzu Chi was planning to offer for foreign migrant workers, he immediately agreed to volunteer. He has been serving since 2004. Having cared for migrant workers for a long time now, Lee realizes more than many others the challenges this group of people face. Many of the foreign workers are employed as live-in care providers for older people or patients. This kind of work is physically demanding. Aside from the pressure of such work, foreign workers have to deal with problems resulting from cultural differences and language barriers. The stress they are under is beyond the imagination of people who haven’t had similar experiences. When they come to the psychosomatic clinic to see a doctor, they aren’t necessarily seeking medical help; sometimes they just need a sympathetic listener, one who shows genuine concern for them and allows them to release their pent-up emotions. “They work cautiously every day,” Dr. Lee said, “fearful of making mistakes and losing their jobs as a result. But in fact, it is because of them that many older people in Taiwan receive such good care. If we look at things this way and show our appreciation for them by caring for them as they have cared for our families, I believe they will work even harder at looking after our seniors.” Lee believes that if foreign migrant workers fail to receive good care in Taiwan and problems arise as a result, it is society as a whole that will carry the burden. Therefore, it is everyone’s responsibility to make these workers feel at home in Taiwan. In the free clinic at Taipei Main Station, Lee teaches migrant workers how to de-stress and relax. He also invites local Tzu Chi volunteers who work as in-home helpers to share their work experience with the foreign workers. The volunteers have all been formally trained and have had rich experiences in providing care for elderly people. They know better than most the likes and dislikes of older people in Taiwan. Their experiences come in handy to help foreign workers interact better with the seniors they care for. Lee is very thoughtful to make this arrangement on behalf of the migrant workers—some have even been moved to tears by his considerate gesture. In the traditional Chinese medicine (TCM) clinic, Dr. Qiu Wei-yuan (邱偉源) was giving a male patient acupuncture treatment. It was the first time the patient had tried this kind of therapy, so he was understandably nervous. As the doctor inserted needles into the man, he soothed him by saying, “It won’t hurt. It won’t hurt.... There. Wasn’t I right? It was painless, right?” The volunteer interpreter off to one side also helped calm the patient. Chen has taken part in the free clinic at the Taipei station since traditional Chinese medicine was first offered there. She has noticed that the majority of migrant workers that gather at the station come from Indonesia and work as live-in care providers, but there are also some from the Philippines, Vietnam, and Thailand. Those who have worked in Taiwan for many years can usually speak some Chinese and have no problems communicating directly with the Taiwanese doctors and volunteers, but even if the foreign workers can’t speak Chinese, there are interpreters around to help them. The dental service at the free clinic boasts the largest number of medical professionals. It also always has the longest line of waiting patients. You Chun-mei (游春美), a dental assistant, pointed out that at least five dentists have to be on duty for every event, and that they treat about 70 patients each time. The dentists work nonstop, which means the dental assistants rarely have time to rest either—they bustle around preparing instruments and medical supplies and giving the dentists whatever assistance they need. In addition to cleaning teeth, filling cavities, extracting teeth, and fixing other dental problems, the dentists at the free clinic provide instruction on dental care too. “You have a bad case of tooth decay and tartar buildup,” a dentist said to a patient, as he urged him to take better care of his teeth. When the dentist finished his treatment, he handed over a small mirror to the patient, who broke into a smile after seeing his now much cleaner teeth. You Chun-mei said that the dentists at the clinic not only see patients for free but also help provide needed medical supplies. They contribute their energy, time, and money to help make the free clinic possible. They serve every patient with care—they don’t skimp on their services just because they are rendered for free. You, a homemaker, is very dedicated to her volunteer work for Tzu Chi. A lot of Tzu Chi work waits for her every day. Even though volunteering keeps her busy and demands a lot of energy, she is never tired mentally. You explained why she is so dedicated to Tzu Chi. 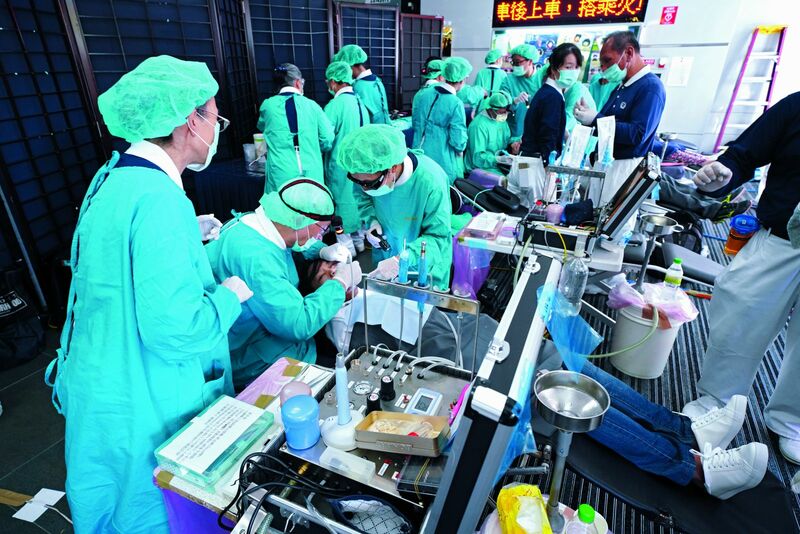 She said that once she took part in a free clinic overseas, and such a huge crowd came for the services that many people still waited to see the doctors when it was time for them to close. Seeing the number of people still needing help, a doctor said to You in a choked voice, “I wish I could stay for a couple more months to help them. But even if I could stay a couple more months, there would still be no way for me to finish seeing all of them.” The physician’s compassion deeply moved You, and it has helped keep her going on her path as a volunteer. As a result of this experience, she never complains about being tired but is instead thankful for every opportunity to give of herself. Zhang Yong-sui (張永隨), a retired nurse, walked from one area of the free clinic to the next, checking on how things were going and filling in wherever she was needed. She joined TIMA when she was still working at National Taiwan University Hospital in Taipei, and has volunteered at Tzu Chi free clinics for migrant workers for eight years. After her retirement, she began serving as a contact person for the volunteer nursing staff at the free clinic at Taipei Main Station. In that capacity, she helps find people to serve at the events. Since nursing is a profession that requires a diverse skill set, and different medical specialties require different nursing specialties, it is not always easy to find an adequate number of suitable people to help. There is a lot of pressure on Zhang as a result, and she once thought of quitting. But then she thought of the people they were helping and decided to persist in this meaningful work. She found that all it took was a shift of mindset. 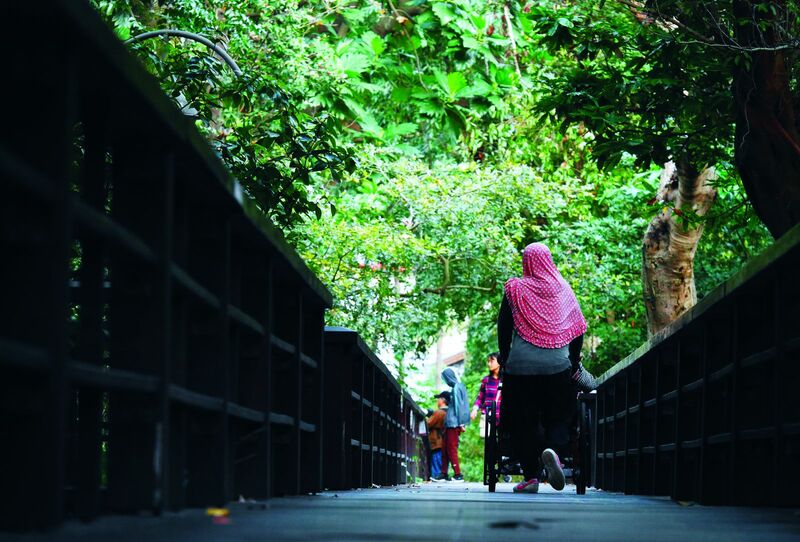 Instead of succumbing to the pressure, “I told myself I should be grateful to the migrant workers for giving me this opportunity to give,” she said. Zhang indicated with an earnest expression that she now takes great pleasure in inviting others to do good, and she is even happier when she sees how their services have helped the migrant workers. She appreciates the fact that even at her age, she is able to put her abilities to good use, which helps her stay mentally active and wards off cognitive decline. Since Southeast Asian societies are arguably more conservative, the gynecology service at the free clinic generally sees a smaller number of people coming to seek help compared with the other specialties. Even so, Dr. Lai Ying-ming (賴英明) has dutifully served at the clinic for years. He has been like a fixture there over the years, helping women with gynecological troubles and providing them with health information. Lai always advises his patients to be sure to take Pap tests. Such a test helps detect cervical cancer early, before symptoms appear. The earlier cancer is detected, the better one’s chance of survival. If there are signs of inflammation, topical medicine or suppositories can be administered to treat the condition. To better serve his patients, Lai found multiple language translations for common medical terms and conditions and wrote them in a notebook. When he sees patients at the free clinic, he uses the list to help determine what is troubling them. A few years earlier, Lai’s mother fell ill and he hired a foreign migrant worker to help care for her at home. That experience allowed him to better appreciate the hard work involved in that line of work. It pushed him to do his best to use his expertise to help that group of people. After visiting Dr. Lai at his clinic, several female patients got into a car driven by a Tzu Chi volunteer heading for Yonghe District, about 15 minutes by car from Taipei Main Station. The car stopped at a gynecology clinic on Chenggong Road. Inside the clinic were already a few female migrant workers from the Philippines, Vietnam, and Indonesia. Because there are no facilities at the Tzu Chi free clinic at Taipei Main Station to conduct Pap smears and other gynecological tests, patients are sent to this clinic run by Dr. Xue Jun-fu (薛俊福) for further examination after being seen by Dr. Lai at the station. Dr. Xue pointed out that female foreign workers might easily suffer from conditions such as irregular menstrual cycles because they are unacclimated to the local environment, unused to the food here, or are feeling stressed living and working in an unfamiliar foreign country. After running tests on a patient, Xue asked her to take out her cell phone and scan the QR code on a desk. “This way it will be easier for us to contact you if there is any problem,” he said to her. He then told her that he had provided a Pap smear for her on this day, and he reminded her to use the suppositories correctly. After the foreign workers were done at Xue’s clinic, volunteers took them back to Taipei Main Station. By the time they had returned, the event had concluded and people were packing up to leave. With warm hearts, everyone said goodbye to each other and called out that they would see each other in two months.